In this simple tutorial, I'm going to show you exactly how you can renew and replace your expired UnionBank EON card. An EON card has a validity period of three years. If you acquired the card on say December 25, 2014, it will expire on December 25, 2017. For you to be able to continue using UnionBank's online and ATM banking services, you need to get a new card. Below are the steps that you need to follow in order to do so. 1) Go to the UnionBank branch that is nearest to you. You need to bring with you your expired card and valid IDs. The bank isn't consistent with regards to the required number of IDs presented so make sure that you bring more than two IDs. When I renewed mine at the Baguio City branch of UnionBank, I presented my Postal ID and birth certificate. For a full list of IDs required by the bank, you can check out the list here. 2) You will be asked to present your expired card and your IDs. Take note that when you surrender your card, you will not be able to do any banking for up to three weeks depending on how long you will have to wait for its replacement. The bank employee will punch a hole in your card. He will also ask you to fill up and sign a form. You will also be required to give to him photocopies of the IDs that you presented. To save time, you should photocopy all your IDs before you enter the bank. This will save you the trouble of going out to have your IDs photocopied and then to have to return again. 3) After completing the form, and submitting the photocopies of your IDs, the employee will then tell you that you will have to wait for two weeks before you return to claim your new EON card. For some branches, this can be a week or even less. Some card holders also claim that they got their new cards just a day after renewal application. With that said, the waiting time varies depending on the branch. 4) Return after two weeks (or the length of time that the employee told you to return). There's nothing else to do except sign a form, get your new card, and you are good to go. You will have to wait for another 24 hours before you will be able to deposit or withdraw from the card. 5) When your new card has been activated, you will also have to update your EON Cyber Account. You will not be able to log into your old account so this step is very important. Here's the step-by-step process on how to do it. Step One: Visit the UnionBank website at http://www.unionbankph.com/. 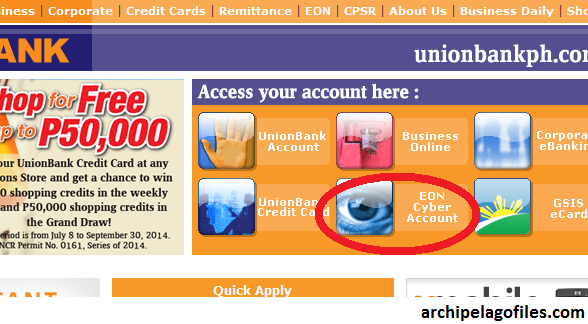 Then click on the tab that says "EON Cyber Account". 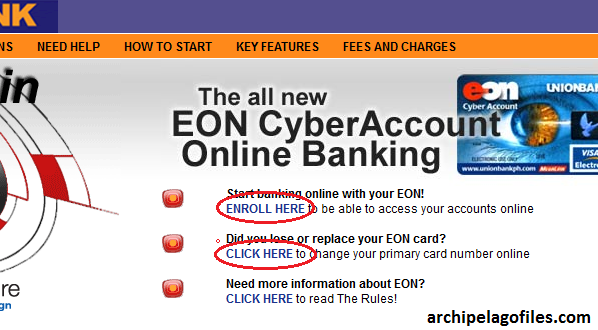 Step Two: Click on either "Start banking online with EON!" or "Did you lose or replace your EON card?". I chose the first option because I forgot the card number of my old card. You will be asked to input your old card number if you choose the second option. With that said, if you can't remember your old card number, I recommend that you use the first option. Step Three: Fill up the form as accurately as possible. After submitting the completed form, you will be informed that you will have to wait for two to three days before you will be able to log-in. In my case, I was able to log-in after two business days. You possibly have to wait longer if say you filled up the form in a Friday. Saturdays and Sundays don't count as business days. So there you go. These are the exact requirements and steps on how to renew your expired UnionBank EON card. For questions, you can leave it in the comments section below. The next step will be to connect your EON card with your PayPal account.